The European Union Center of Excellence at UNC-Chapel Hill collaborated with World View to organize and sponsor the 2013 World View Spring Regional Seminar for K-14 educators focusing on the theme Europe in Crisis? Dispelling Myths about the EU. The seminar consisted of plenary lectures and concurrent sessions on the politics, history, and the economies of Europe led by UNC faculty and experts from the triangle area. The seminar attracted more than 120 teachers from all over the state, over twenty of whom participated in a summer study program to the Balkans. Following is the seminar schedule, links to the presentations, and handouts from the study handouts from the March 2013 seminar. 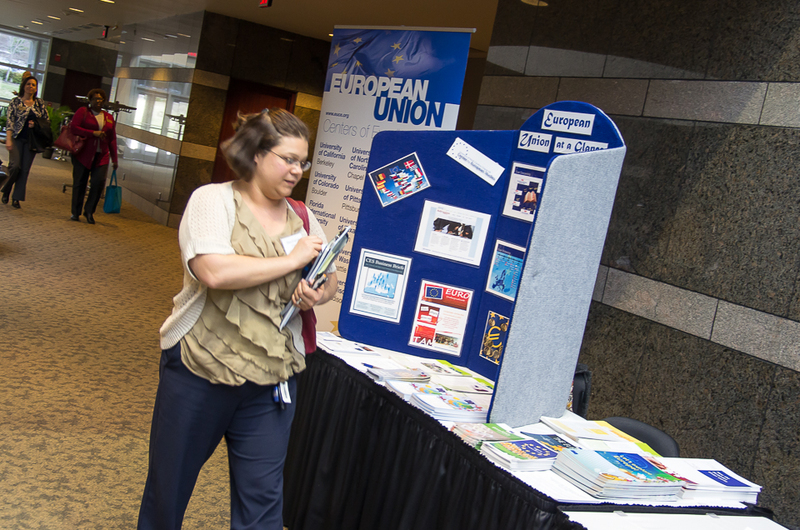 CES International Education Coordinator, Anna Brigevich, presents teaching resources on contemporary Europe and the European Union at the NCCSS Conference in Greensboro, NC (February 2013). CES International Education Coordinator, Anna Brigevich, presents teaching resources on contemporary Europe and the European Union at the NCSS Conference in Seattle, WA (November 2012). The European Union Center of Excellence at UNC-Chapel Hill hosted a workshop for K-12 educators on the European Union and the new educational standards in North Carolina. Contained below are links to the presentations and resources from the June 2012 workshop. Director of Outreach Programs, Gali Beeri, presents teaching resources on contemporary Europe and the European Union at the NCCSS Conference in Greensboro, NC (February 2012). In collaboration with Carolina K-12 (formerly the North Carolina Civic Education Consortium) and Carolina Public Humanities (formerly the UNC Program in the Humanities and Human Values), the European Union Center of Excellence at UNC-Chapel Hill hosted a professional development opportunity for North Carolina educators titled, “The Future of Europe,” in December 2011. The purpose was to educate teachers about the European Union, to provide them with EU-centered curriculum that they could easily implement in their middle and high school classrooms, and to share the Center’s myriad resources for teachers. To accomplish these goals, the seminar was divided into two separate components – pedagogical training with the CEC and EUCE and an Adventures in Ideas scholarly seminar featuring various UNC and Duke University faculty. The European Union Center of Excellence at UNC-Chapel Hill collaborated with World View to sponsor a workshop for K-12 educators on the European Union and the Euro currency. Contained below are links to the presentations and handouts from the May 2011 workshop. Papers mentioned: Managing a Fragile Eurozone (P. De Grauwe); Fixing the Flaws in the Eurozone (S. Black). The UNC Center for European Studies presented a session for K-12 teachers on Teaching Contemporary Europe and the European Union. The session was designed to help educators to prepare their students to become global citizens by discovering contemporary Europe and the EU, a key actor in today’s world. Educators learned how to access a variety of free teaching resources for grades K-12, including lesson plans, games, online videos, music, and other informational sources, helping integrate technology into the classroom. The UNC-Chapel Hill European Union Center of Excellence collaborated with World View to sponsor a workshop for K-12 educators on creating EU lesson plans. Contained below are links to the presentations, handouts, and video clips from the workshop. The European Union Center of Excellence at UNC-Chapel Hill collaborated with World View to sponsor a workshop for K-12 educators on the European Union and the Euro currency. Contained below are links to the presentations and PDF handouts from the workshop. The European Union Center of Excellence at UNC-Chapel Hill collaborated with World View to sponsor a workshop for K-12 educators on the European Union and the Euro currency. Contained below are links to the presentations and handouts from the May 2009 workshop.